Today, I stopped development of TunesTEXT. I'll no longer update this software. Thanks for all your feedback. Thanks for your cheers. And I'm sorry for causing inconvenience to you. At present, TunesTEXT 0.8.18 can't search lyrics on Metrolyrics or SING365.com. However, I won't fix this probrem. Sorry again. v0.8.18 (Final version) : Apr 9, 2012 : 未使用時にCPU使用率が下がらない不具合を修正。 Fixed a bug causing unusual CPU usage. v0.8.17 : Mar 3, 2012 : MetroLyrics 歌詞に不要な文字が入る不具合を修正。 Removed irrelevant characters from lyrics on MetroLyrics. 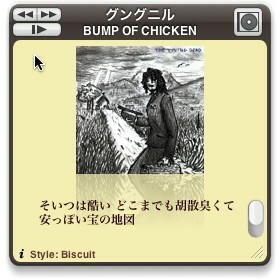 v0.8.16 : Feb 2, 2012 : うたまっぷ 検索結果の取得漏れを修正。 Fixed a bug with searching lyrics on Utamap. v0.8.15 : Jan 4, 2012 : SING365.COM 歌詞に不要な文字が入る不具合を修正。MetroLyrics 曲名検索時にクラッシュする不具合を修正。 Removed irrelevant characters from lyrics on SING365.COM. Fixed a crash that could occur when searching lyrics on MetroLyrics. v0.8.14 : Oct 9, 2011 : MetroLyrics 検索に失敗する不具合を修正。 Fixed a bug with searching lyrics on MetroLyrics. v0.8.13 : Jul 29, 2011 : MetroLyrics 歌詞に不要な文字が入る不具合を修正。 Fixed a bug with downloading lyrics from MetroLyrics. v0.8.12 : Jul 22, 2011 : OS X Lion および最新の Safari をインストールした環境に対応しました。 TunesTEXT is now compatible with OS X Lion and the latest Safari. v0.8.11 : Apr 3, 2011 : SING365.COM および MetroLyrics 検索に失敗する不具合を修正。 Fixed bugs with searching lyrics on SING365.COM and MetroLyrics. v0.8.10: Sep 11, 2010 : MetroLyrics 歌詞に不要な文字が入る不具合を修正。 Fixed a bug with downloading lyrics from MetroLyrics. v0.8.9 : Aug 20, 2010 : SING365.COM 歌詞のダウンロードに失敗する不具合を修正。 Fixed a bug with downloading lyrics from SING365.COM. v0.8.8: Jun 5, 2010 : MetroLyrics 検索に失敗する不具合を修正。 Fixed bugs with searching lyrics on MetroLyrics. v0.8.7 : Mar 31, 2010 : MetroLyrics 検索に失敗する不具合を修正。 Fixed bugs with searching lyrics on MetroLyrics. v0.8.5 : Jan 27, 2010 : TunesTEXT が起動に失敗する不具合を修正。 Fixed the bug that TunesTEXT fails to start. v0.8.4 : Jan 24, 2010 : SING365.COM および MetroLyrics タイトル検索に失敗する不具合を修正。Tiger (Mac OS X 10.4)環境における不完全なローカライズを修正。 Fixed bugs with searching lyrics by title on SING365.COM and MetroLyrics. Fixed localization bug on Tiger (Mac OS X 10.4). v0.8.2 : Dec 12, 2009 : うたまっぷ歌詞が文字化けする不具合を修正。 Fixed a bug with downloading lyrics from Utamap. v0.8.1 : Apr 17, 2009 : MetroLyrics 歌詞に不要な文字が入る不具合を修正。 Fixed a bug with downloading lyrics from MetroLyrics. v0.8 : Apr 6, 2009 : 歌詞の手動検索機能に曲名／アーティスト名の入力ボックスを追加。MetroLyrics アーティスト検索の不具合を修正。デザイン微調整。 Added Name and Artist search fields. Fixed a bug with searching lyrics from MetroLyrics. Minor design update. v0.7.14 : Jan 24, 2009 : アートワーク表示機能の不具合を修正。 Fixed a bug with displaying the artwork. v0.7.13 : Dec 28, 2008 : SING365.COM アーティスト検索の不具合を修正。メモリ使用量の削減。 Fixed a bug with searching lyrics on SING365.COM. Reduced memory usage. v0.7.10 : Apr 13, 2008 : MetroLyrics 歌詞に不要な文字が入る不具合を修正。 Fixed a bug with downloading lyrics from MetroLyrics. v0.7.9 : Apr 7, 2008 : MetroLyrics 歌詞のダウンロードに失敗する不具合を修正。 Fixed bugs with downloading lyrics from MetroLyrics. v0.7.8 : Feb 17, 2008 : SING365.COM 歌詞のダウンロードに失敗する不具合を修正。アーティスト名検索の精度向上。 Fixed bugs with searching and downloading lyrics from SING365.COM. v0.7.7 : Feb 13, 2008 : SING365.COM 歌詞に不要な文字が入る不具合を修正。 Fixed bugs with downloading lyrics from SING365.COM. v0.7.6 : Feb 11, 2008 : SING365.COM サーバ仕様の変更に対応。 Fixed bugs with searching lyrics on SING365.COM. v0.7.5 : Jan 8, 2008 : SING365.COM 歌詞のダウンロードに失敗する不具合を修正。MetroLyrics 歌詞に不要な文字が入る不具合を修正。歌詞中の改行が反映されないことがある不具合を修正。 Fixed bugs with downloading lyrics from SING365.COM and MetroLyrics. Fixed a bug with displaying line breaks in the lyrics. v0.7.4 : Oct 31, 2007 : Leopard (Mac OS X 10.5) に対応しました。 Leopard (Mac OS X 10.5) compatible. v0.7.3 : Sep 29, 2007 : MetroLyrics アーティスト検索の不具合を修正。 Fixed a bug with searching lyrics on MetroLyrics. v0.7.2 : May 28, 2007 : MetroLyrics で取得した歌詞に不要な文字が混じる不具合を修正。 Fixed a bug with downloading lyrics from MetroLyrics. v0.7.1 : Apr 8, 2007 : MetroLyrics タイトル検索の不具合を修正。エラーメッセージが歌詞として登録される不具合を修正。 Fixed some bugs with lyrics search. v0.7 : Apr 1, 2007 : 洋楽歌詞検索サイト MetroLyrics を追加。歌詞検索サイト選択機能を追加。歌詞保存忘れ確認ダイアログを追加。スクロールバーが消える不具合を修正。 Support for MetroLyrics the lyrics database. Added an option to select lyrics databases. Added a save reminder dialog. Fixed a bug with a scroll bar. v0.7b3 : Mar 27, 2007 : v0.7b2 の一部不具合を修正。 Minor bug fixes. v0.7b2 : Mar 26, 2007 : バージョン 6 以前の iTunes で利用できない不具合を修正。 Restored compatibility with iTunes 6 or older. v0.7b1 : Mar 25, 2007 : 洋楽歌詞検索サイトを SING365.COM から MetroLyrics に変更。 Changed the lyrics database SING365.COM to MetroLyrics. v0.6.4 : Mar 3, 2007 : SING365.COM 検索機能の不具合を修正。 Fixed a bug with searching lyrics on SING365.COM. v0.6.3 : Oct 5, 2006 : iPod 内の曲にも歌詞埋めこみができるよう修正。ウインドウの半透明背景を廃止。 TunesTEXT can now embed lyrics on music files in the iPod. v0.6.2 : Apr 4, 2006 : SING365.COM 検索結果に、歌詞入手不可能な曲が混じる不具合を修正。 Fixed a bug with searching lyrics on SING365.COM. v0.6.1 : Mar 24, 2006 : デザインを変更。 New widget design. v0.6 : Mar 22, 2006 : アートワーク表示機能を搭載。 Added the artwork view. v0.5.5 : Mar 7, 2006 : うたまっぷ 仕様変更による検索機能の不具合を修正。（再度） Fixed a bug with searching lyrics on Utamap. v0.5.4 : Mar 7, 2006 : うたまっぷ 仕様変更による検索機能の不具合を修正。 Fixed a bug with searching lyrics on Utamap. v0.5.3 : Feb 10, 2006 : うたまっぷ 仕様変更による検索機能の不具合を修正。ウインドウサイズを記憶するよう修正。 Fixed a bug with searching lyrics on Utamap. Widget remembers window size now. v0.5.1 : Dec 10, 2005 : 歌詞検索中に再生曲が変わったときに発生する不具合を修正。 Fixed a bug that would cause incorrect behavior if track changed while searching lyrics. v0.5 : Dec 9, 2005 : iTunes コントローラを追加。 Added iTunes control buttons. v0.4.11 : Dec 5, 2005 : うたまっぷ 仕様変更による検索機能の不具合を修正。 Fixed a bug with searching lyrics on Utamap. v0.4.10 : Nov 30, 2005 : うたまっぷ 仕様変更による検索機能の不具合を修正。 Fixed a bug with searching lyrics on Utamap. v0.4.9 : Nov 21, 2005 : うたまっぷ 仕様変更による検索機能の不具合を修正。 Fixed a bug with searching lyrics on Utamap. v0.4.7 : Oct 26, 2005 : うたまっぷ 検索機能の不具合を修正。 Fixed a bug with searching lyrics on Utamap. v0.4.6 : Oct 15, 2005 : うたまっぷ 検索機能の不具合を修正。 Fixed a bug with searching lyrics on Utamap. v0.4.5 : Oct 13, 2005 : 歌詞埋めこみに失敗したときに発生する不具合を修正。タイトルバーのデザイン変更。 Fixed a probrem when failed to embed lyrics. v0.4.4 : Sep 30, 2005 : うたまっぷ 検索機能の不具合を修正。 Fixed a bug with searching lyrics on Utamap. v0.4.3 : Sep 30, 2005 : うたまっぷ 検索機能の不具合を修正。 Fixed a bug with searching lyrics on Utamap. v0.4.1 : Sep 15, 2005 : 歌詞埋めこみ機能の安定性改善。 Stability improved when embeding lyrics. v0.3.4 : Jul 22, 2005 : 安定性改善のための微修正。 Stability improved a little. v0.3.2 : Jul 12, 2005 : 歌詞が見つからなかったときに発生する不具合を修正。 Fixed a probrem when lyrics not found. v0.3.1 : Jul 12, 2005 : うたまっぷ 検索機能の不具合を修正。 Fixed a bug with searching lyrics on Utamap. v0.3 : Jul 7, 2005 : ウインドウサイズ自動調整機能を搭載。歌詞検索精度を改善。 Added an option to resize window automatically. Internet lyrics search has been updated. v0.2.2 : Jun 30, 2005 : ラジオおよびポッドキャストでは歌詞を読み込まないよう修正。 TunesTEXT will not load lyrics while iTunes playing radio or Podcasts. v0.2.1 : Jun 26, 2005 : 歌詞編集画面で一部キー入力ができない不具合を修正。 Fixed a bug with lyrics editor mode. v0.2 : Jun 25, 2005 : スタイル／文字サイズ切り替え機能を搭載。 Widget color and font size are now selectable. v0.1.1 : Jun 23, 2005 : iTunes 停止時の不具合を修正。 Fixed a probrem when iTunes is not working. v0.1 : Jun 22, 2005 : 初公開。 First release. 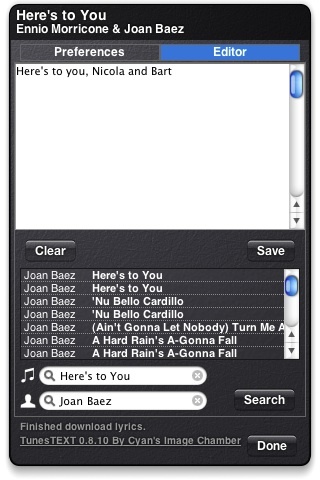 To change widget settings or modify lyrics yourself, click the "i" button and display reverse side. TunesTEXT supports Utamap (Japanese song), MetroLyrics and SING365.COM. Using too many databases may increase the response time. To save lyrics you edit, click "Save" button. To search lyrics, type the name of the song and artist in search fields, and click "Search" button. To download lyrics, click a title in the song list. Most of the lyrics are covered by copyrights. When using lyrics, observe the rule. While lyrics editor is shown, auto refresh is disabled. TunesTEXT(v0.2.3 - 0.4.2) uses OgreKit.framework for regular expression.